Senate President Pro Tempore John Campbell (D-Windsor) talks to Tim Ordway of Bennington (left) and other gun owners Tuesday in the Statehouse cafeteria. Every year, Vermont sportsmen host a reception for state legislators. A bunch of gun owners show up and remind lawmakers how important their right to bear arms is. This year, that bunch was quite a bit larger. All it took to crank up turnout was a couple of gun bills on the legislature’s agenda. Dozens of gun owners, most of them clad in blaze orange, flannel and Carhartts, streamed into the Statehouse Tuesday afternoon to weigh in on the legislation. “This year there’s more interest because of S.31,” said Evan Hughes, vice president of the Vermont Federation of Sportsmen’s Clubs. He was referring to a bill introduced last week by Sens. John Campbell (D-Windsor), Phil Baruth (D-Chittenden) and Claire Ayer (D-Addison) that goes further than most proposals in a state where gun rights are fiercely guarded. The bill would require background checks for all guns sales, including those conducted privately. It would ban those convicted of a felony from possessing a gun. And it would require the state to report the names of potentially dangerous, mentally ill people to a federal database used to screen gun buyers. Lawmakers are also expected to consider a charter change Burlington voters overwhelmingly passed last March that would prohibit guns in bars, require guns to be stored in locked containers and allow police officers to confiscate weapons from suspected domestic abusers. Gun owners with signs reading “No Vermont gun control” outnumbered legislators in the Statehouse cafeteria throughout the afternoon, as some lawmakers deliberately steered clear of the gathering. 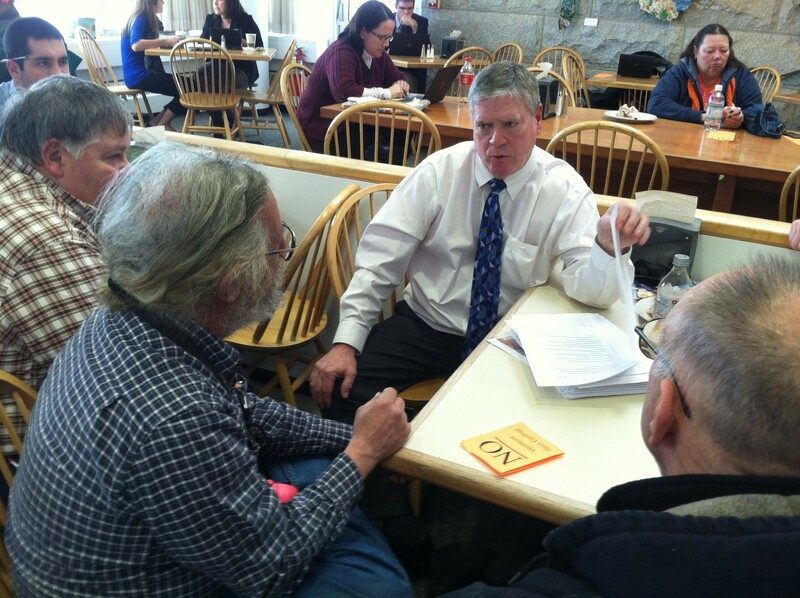 Four gun owners button-holed Campbell, the Senate President Pro Tem and the bill’s lead sponsor, at a cafeteria table. Campbell didn't shy away from a discussion it was clear no one would win. “All I can tell you right now is there is no gun registration in the bill,” Campbell told Tim Ordway of Bennington. If there were, Campbell said, there’d be a lot more people protesting. Ordway was impressed that Campbell is a gun owner himself but was unappeased by his reassurances. “Universal background checks lead to registration,” Ordway said afterward. He and his fellow gun owners are flat-out opposed to anything that resembles gun registration, seeing it as a sign the government will someday seize their guns. If a bill makes it through the legislature, Ordway and his compatriots have Gov. Peter Shumlin on their side. “I believe current law around guns have served us well,” Shumlin said at a press conference Tuesday afternoon. The public will have a chance to air their opinions about S.31 at a hearing the Senate Judiciary Committee has scheduled for February 10 from 5:30 to 8 p.m. in the House chamber. Lawmakers are also likely to see a crowd gather when the House starts considering last year’s Burlington charter change. Legislators put off consideration of the measure last year, saying the issue was too complicated to the tackle in the last two months of the session. A group of Burlington legislators plans to reintroduce a bill that’s needed for the charter change to take effect, said Rep. Kesha Ram (D-Burlington). “I expect it will probably get a hearing,” House Speaker Shap Smith (D-Morristown) said Tuesday. The lawyers indicated it would be legal for Burlington to enact its own gun rules, Sweaney said. The debate will be over whether one community should have its own gun rules, she added. “That will be the main thrust of this," Sweaney said. "Do we go town by town, or do we want a unified law for the state?"